These soft caramels have a creamy, chewy texture that melts in your mouth and never sticks to your teeth. They are delicious on their own, dipped in chocolate, or used in other baked goods. 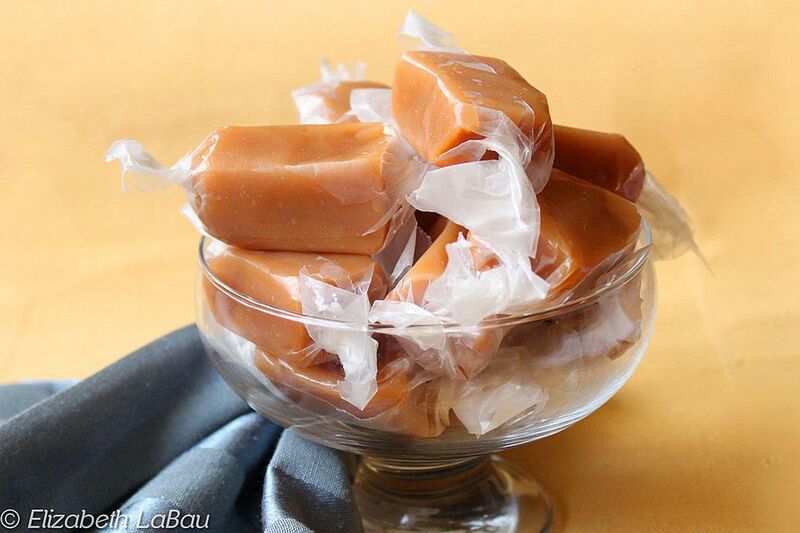 For the best texture, allow the caramels to sit at room temperature overnight to fully set up. Don't miss the photo tutorial with step-by-step pictures showing how to make caramels. Try using these delicious caramels to make caramel-wrapped pretzel rods! Combine the cream and condensed milk in a small saucepan, and place the saucepan on a burner set to the lowest heat setting. You want the milk and cream to be warm, but do not allow it to boil. In a medium-large saucepan combine the corn syrup, water, and granulated sugar over medium-high heat. Stir the candy until the sugar dissolves, then use a wet pastry brush to wash down the sides of the pan to prevent sugar crystals from forming and making the candy grainy. Insert a candy thermometer and reduce the heat to medium. Allow the mixture to come to a boil and cook until the thermometer reads 250 degrees. Add the softened butter chunks and the warm milk-cream mixture. The temperature should go down about 30 degrees. Continue to cook the caramel, stirring constantly so that the bottom does not scorch. Cook it until the thermometer reads 244, and the caramel is a beautiful dark golden brown. Remove the caramel from the heat and immediately pour it into the prepared pan. Do not scrape candy from the bottom of the saucepan. Allow the candy to sit overnight to set up and develop a smooth, silky texture. When you are ready to cut the caramel, place a piece of waxed paper on the counter and lift the caramel from the pan using the foil as handles. Flip the top of the caramel onto the waxed paper and peel the foil layer from the bottom of the caramel. Spray a large knife with nonstick cooking spray. Firmly cut into the caramels, creating 1” squares. Wipe the blade and re-spray as necessary. Wrap the squares in waxed paper. The caramels will gradually spread and lose their square shape if not wrapped soon after cutting. Alternately, you can dip them in chocolate once they are cut. Store the caramels at room temperature for up to two weeks.